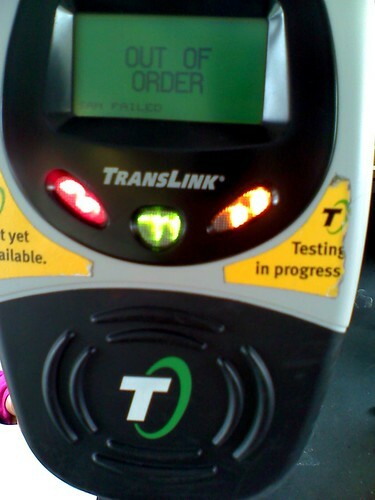 UPDATE (8:40AM): TransLink/Clipper card readers now say "Touch Card Below" instead of "Tag Your Card." We are just a couple of days until TransLink will officially turn into the Clipper card (Wednesday, June 16th). Last week Friday, I was called by a TL/Clipper rep and invited to their press conference, but I'm not sure if my boss will give me the time off needed to be there for the historic moment (fingers crossed!). The automated add value machines now have updated software on their screen. It's not a huge update, but you'll notice the new blue Clipper graphic and all words saying "TransLink" is now "Clipper." I've produced a video for you to demonstrate how the add value machine works when using cash (bills) to be converted into e-cash for the card. Adding e-cash is quick when you feed the machine cash, and the funds are available instantly for use. In other news, it looks like the vehicle card readers have been given another update, and it's not going so hot. Since Friday, I have been riding Muni metro to get to the Giants-A's ballgames at AT&T Park and other short trips since the trains have oh so cool air conditioning in the hot heat. While waiting for the train at the stations, I've noticed a lot of the metro card readers with all three color lights active, and it was when I rode the train late at night on Saturday after taking photos of the Giants County Fair, that I noticed the software change in the broken reader screen (see photos below). The reader now says: "Out of Service"
The readers used to say prior to this update: "Out of Order"
This is the second time a lot of card readers have failed at once. If you recall, on April 16, 2010, a software update on the vehicle card readers caused a massive failure of the system and all three color lights was lit. Their official response of the April 16th incident in a presentation at a MTC meeting: "The DesFire software release on April 16th caused many on-board CID1s to power down after reboot." Their official response of the April 16th incident on TL's Facebook page: "Translink apologies for any problems cause by a large number of card readers being out of service last weekend. You may have noticed this if you rode the bus or Muni metro. The problem occurred due to a bug in new software being rolled out to the readers; the problem should now be fixed." So the software update fails again. Haven't they ever heard of testing the software PRIOR to updating the card reader devices, and if there are going to be problems, have people on-site ready to resolve it before the public even senses there is an issue? What happens when the Clipper card goes full blown mainstream and there's a software update glitch/problem? The answer is simple, transit agencies will lose thousands of dollars in fare revenue. The next TransLink/Clipper management meeting is Monday, June 28th, and I'm going to bet the board members are going to shake their fists at the contractor. Why you ask? The board members are the big bosses for the transit agencies they represent, like Nat Ford for Muni, and Michael Burns for VTA. "Can I see your TransLink or Clipper card?" Maybe instead of two separate names for the same purpose, maybe us locals should combine the two brand names into the nickname "Tripper" or "Tipper." Sorry to comment on a few days old post, but it raised the question for me about what to do when the reader is broken on a Muni bus. 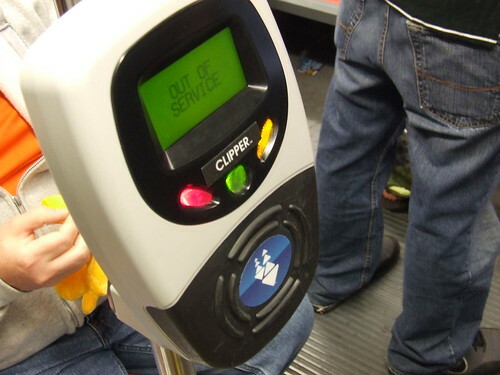 Have you heard anything yet about whether SFMTA would or would not force passengers with TransLink/Clipper cards that have a Fast Pass loaded onto them to pay cash? The couple of times the reader was broken the driver was rather disinterested in the whole enforcing payment for service aspect of his job and didn't react when I went "Oh" upon seeing the broken reader and looking at him for a clue as to my next move, so I just got on. These experiences do not give me much insight as to what should happen because they were on the 36-Teresita and in my five years of riding that line in general I have found that the evening drivers don't care if you pay or not - they never look at passes and most people just board without flashing anything. I always carry my fast pass receipt because I use the add value machines, but I can see a driver not wanting to get into that. Could I get a refund if forced to pay $2? How would I prove that I needed one? And thanks for all the info on your blog about TransLink/Clipper - it's been a helpful resource for me! Great question. It's been a big gray zone for transit agencies when the card readers are not operational. Some demand payment while others don't, then comes the fare inspectors who also are wishy washy. I used to have a pass on my card, and whenever I was demanded to pay, I either chose to ride the next one or pay up. If I paid-up, I'd call TransLink/Clipper and they would reimburse me. I'm hopeful the transit agencies treat them as a broken farebox and gets it either fixed or a replacement bus.